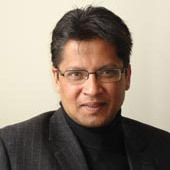 Ashutosh Sheshabalaya heads SolvX, a global security services and research firm. An emerging market perspective on a presumed American cataclysm. How are the effects of the economic crisis visible to a motorcyclist riding through Europe? How does Europe look through the eyes of an Indian motorcyclist? How have India’s early scientists impacted Western thought? Why do China and India think in terms of generations, not quarterly results? How does the collapse of an Indian IT giant really affect the country’s industry as a whole? Will the current financial crisis be remembered as a devasting collapse or just a minor shifting of the ground? Is the $2,500 Tata Nano a symbol of India’s overlooked influence in innovation and global manufacturing? Is the Nuclear Non-Proliferation Treaty in need of an update due to rising concerns over Iran? In what way has President Bush’s diplomacy with India been a success — regardless of what his critics say?